Location: Brampton Bryan, Herefordshire, England. Notes: Brampton Bryan Castle is in the small village of Brampton Bryan in north-western Herefordshire, England, 50m south of the River Teme. The castle guarded an important route from Ludlow along the Teme Valley to Knighton and on into Central Wales. The standing remains are a Grade I listed building consisting of local sandstone rubble and ashlar that represent several phases of construction. 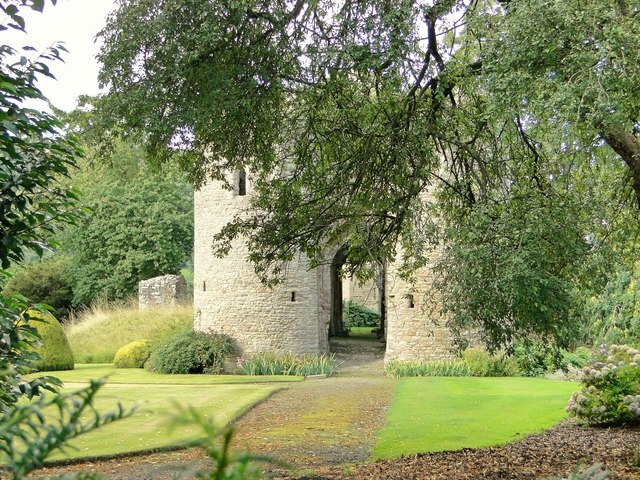 The standing remains consist of an outer gate hose and parts of the inner gatehouse and part of the south wall of the kitchen range and the great hall. The site also contains the buried remains of a quadrangular castle. The earliest documentary evidence of the site mentions a "tower with curtilage" on the site in 1295. At its height and several phases of development the medieval layout appears to have sat on a motte and was surrounded by a moat. Access was via a bridge from the south which lead into a gatehouse in the southern curtain wall. This was a large building consisting of an inner gatehouse to which a larger outer gatehouse (which projected out from the curtain wall) was added at a later date. The passage through the gatehouse led into a square courtyard which was surrounded by ranges of buildings that abutted the curtain walls. The great hall was located on the first floor of the northern range, with the kitchens to the east. The other ranges consisted of private accommodation (and presumably utility rooms for stabling of horses and all the other services a medieval castle needed). The castle ruins are built out of local sandstone rubble and ashlar, and are listed as Grade I. These ruins represent several phases of construction, and include the outer gatehouse, part of the inner gatehouse and part of the south wall of the hall and kitchen range. Landscaping for the later house and gardens have obscured the full extent of the castle buildings but it is thought that the steep slope to the north of the hall range wall represents the northern edge of the original motte.